There is a giant red star called Betelgeuse. I pronounce its name "Beetle Juice", which isn't the right way, I know. It is about 700 times the diameter of the sun. If it were placed where the sun is, we would be inside it. Its surface would be somewhere around the orbit of Jupiter. It is one of the corner stars of the Constellation of Orion. Some people say its name means "arm pit" because it is located in the arm pit of Orion the hunter as depicted in the ancient Zodiac. Betelgeuse is about 640 light-years from Earth. This is for­tunate because it is thought to be very unstable. It could explode at any time soon into a supernova, as illustrated on the left. Scientists speculate that when it does, despite its great distance, it will shine in our sky like a second sun for 10 days or so. After this, it is thought that Betelgeuse will collapse into a tiny neutron star of only 20 km diameter. But people on Earth will only witness this event 640 years after it has happened. This is because the supernova flash, travelling at the speed of light, will take 640 years to reach us. On the right, the white circle represents the wave-front of the light from the supernova flash about 320 years after the event. Betel­geuse itself no longer exists. Only the small neutron star, which we can't see, sits in its place. Nevertheless, as we look into the night sky, we still see the great red giant in all its majesty. This is because the light of its image now entering our eyes began its journey to Earth 320 years before Betelgeuse exploded. For more than a further 320 years, the flash from the Betelgeuse supernova will contin­ue on its journey to us as an expanding shell of intense-yet-invisible electromagnetic stresses in the fabric of space. I am writing this in the year 2013 AD. Suppose our descendants witness the Betel­geuse supernova in 2333 AD. For this to happen, Betelgeuse must have exploded as a supernova in 1693 AD. This means that Betelgeuse exploded when Edmund Halley (the famous astronomer after whom the comet is named) published his paper "An Estimate of the Degrees of the Mortality of Mankind". The trial of the Salem Witches was taking place and Louis XIV was attacking Heidelberg. But humanity will not wit­ness this past event until more than 320 years from now. But does this make sense? Is this notion of time correct? Is it valid to think of Halley's time on Earth being the same time as that in the vicinity of Betelgeuse when it went supernova? Is a statement like "Betelgeuse went supernova in 1693" scientifically meaningful? If so, it implies that time is some kind of absolute universal measure. It is the same in every place. By this I am not saying that time has to be measured in the same units everywhere. We use as our basis for measuring time the Anno Domini scale of years. Time could, however, be measured in various scales in the same way that temperature (which has a universal absolute zero) can be expressed in different scales like Kelvin, Celsius or Fahrenheit. We could, theoretically, instead use the rotation period of the Milky Way galaxy or the period of the H-alpha line of hydrogen in zero gravity as our basic unit for measuring time. But whatever unit we use to divide time, we are measuring something which we perceive to be essentially the same all over the uni­verse. If this reasoning be true, we can say that Betelgeuse going supernova and Edmund Halley publishing his paper on "An Estimate of the Degrees of the Mortality of Mankind" were simultaneous events. These events were simultaneous not only from Halley's point of view but also from our point of view here and now and also from the point of view of our descendants who will witness the supernova in 2333. And this is despite both the Earth and the point where Betelgeuse was when it exploded having moved vast distances since that event. This all lends weight to the idea that time itself has some kind of universal aspect. It means that the "point" in time we call 1693 (on whatever scale it is measured) exists conceptually as the same "instant" throughout the entire universe. Suppose that, in the year 2333 AD, my grandson × great12 (I didn't want to write "great" 12 times) is getting a nice tan one night under the scorching brilliance of the Betelgeuse supernova. He thinks: "this heat I am now feeling and the brilliance I am now seeing was caused by a short-lived event that occurred in 1693". He thinks this because he knows, from generally available astronomical knowledge, that the eff­ect of the Betelgeuse supernova has taken 640 years to reach him. Notwithstanding, as a scientist, my grandson × great12 can only (objectively) obser­ve the effect of the Betelgeuse supernova in his "here and now". The cause of that effect - the event of 1693 in the Constellation of Orion - is something with which he can never connect. It is not part of his universe, never was, and never will be. In other words, it is outside of his personal past event horizon. It is something he can only deduce from the scientific axiom that an effect has a cause, even though the cause be fundamentally outside his realm of observability. He thus perceives, with his mind's eye, something that he can never observe. The publication of Halley's paper and the explosion of Betelgeuse are thus a perceived simultaneity, not an observed one. Yet I think it would be arrogant of any scientist to assert that whatever is outside his own personal past event-horizon does not exist - even in the context of a purely material universe. In other words, there is an awful lot more to the material universe than humanity's past event horizon as observable from our little blue space ball. In Chapter 9 of his book "Relativity - The General and Special Theory" Albert Einstein uses a "moving" train and a "stationary" railway line embankment as two frames of reference in relative motion to illustrate the notion of the relativity of simultaneity. His two "simultaneous" events are not supernovae but lightning strikes. To illustrate the relativity of observed simultaneity, I prefer not to complicate the issue by using frames of reference in relative motion. I prefer instead to use one frame of refer­ence and simply move the observer from one place to another within the frame. I also prefer to keep with my supernovae rather than change to lightning strikes. Suppose Betelgeuse has a twin called Bugjuice, which is also 640 light-years from Earth but in the opposite direction from Betelgeuse. Both go supernova at the same instant in 1693. My grandson × great12 should see both supernovae occurr­ing simultaneously in the year 2333, as depicted on the left. 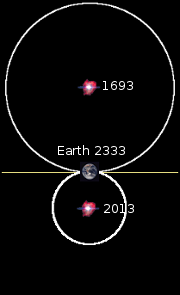 The two supernovae should also be seen simultaneously at any place on the line that contains all points that are equidistant from the two supernovae. In fact the line is a representation in a two-dimensional diagram of what is, in reality, a plane in 3-dimensional space. If the Earth be in the position as shown in the illustration on the right, the events will be seen later, perhaps during the life of my grandson × great15. 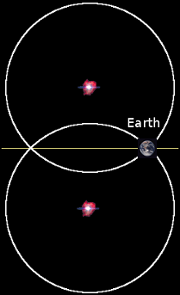 If we know by some means other than the velocity of light (such as historical paral­lax measurements) that these two stars are equidistant from the Earth, then by the axiom that an effect has a cause, we can assert that, in the context of the universe as a whole, they were simultaneous. Of course, if the Earth is anywhere in space other than on the plane of equidistance from the two supernovae, then the two supernovae will not appear to have occurr­ed simultaneously, even though Betelgeuse and Bugju­ice both exploded in 1693. Could the two supernovae appear to be simultaneous when they are not simultaneous in the universal sense? Suppose Bugjuice is only 320 light-year from Earth. 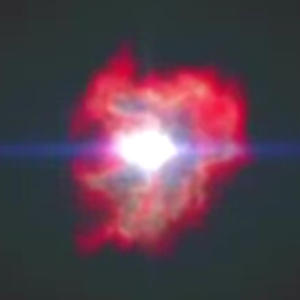 The flash of the supernova from Bugjuice will take only 320 light-years to reach Earth. Yet my grandson × great12 sees all measurable effects from both supernovae arriving simultaneously. For this to happen, Betelgeuse would still have had to go supernova in 1693. Bugjuice, however, must be going supernova right now in 2013. The two events cannot have occurred at the same "time". If my grandson × great12 knows by historical parallax measurements that Bugjuice is only half the distance of Betelgeuse, he will deduce perceptually that the two supernovae were not simultaneous, even though all effects emanating from the two events are seen, felt and measured simultaneously. I therefore perceive that effects that I observe to be simultaneous, within the con­fines of my personal past event horizon, did not necessarily have simultaneous causes within the universe at large. If the sun suddenly ceased to exist, it would appear to us to shine for a further 8 minutes. This is the time its light takes to reach us here on Earth. But more than this, its gravity would also continue to hold us in its orbit for another 8 minutes. The fabric of space, as stressed by the sun's mass, would not relax until a "gravity wave" travelling at the speed of light, arrived to unstress it. In essence, it is not just light that is constrained to the universal speed limit of 'c'. The intimation of all pheno­mena and events can only flow from a cause to an affected observer at this maxi­mum speed. The upshot is that, from my point of view, as an observer within the universe, reality is limited to what exists within my own personal past event horizon. My past event-horizon is the whole of my realm of reality. Nothing outside of it is part of my uni­verse. Consequently, what it is fundamentally possible for me to observe - relativ­istic effects and all - is for me the entirety of reality. But what is the form and nature of this realm of reality? Objects and events close to me exist and occur in my present. As objects and events become more distant from me, they become also older. They are further into my past. I see them not as they are but as they were. I see them as much younger than they are "now". But "now" does not exist "out there" within my personal past event-horizon. It does not exist within my realm of reality. Only a progressively older past of younger objects and events exists within my universe. This raises an interesting question: where is the oldest place in my universe? If I define the universe as being the whole of, and being limited to, that which can affect me, then the oldest place in the universe is the point singularity at which my conscious self-awareness interfaces with my personal past event-horizon. Nothing outside this can communicate in any way with my sentient being. Thus, each person's reality is his personal past event horizon. What is within it is real. Anything outside it is not. This, to me, is an observer's objective vision of the relativistic universe. But this leaves me with a conundrum. Although my whole material existence is im­prisoned within my personal past event-horizon, my conscious mind can, neverthe­less, conceive of a plausible reality outside it. Indeed, I would go so far as to say that my conscious mind is aware of a plausible reality beyond the walls of my rela­tivistic prison. For example, I can mentally transport myself to the vicinity of Betelgeuse in 1693 and see it explode. Furthermore, this is consistent with the effect observed by my grandson × great12 in 2333 AD. Both these events - one cause and one effect - are outside my personal past event-horizon. But for them to occur does not violate any of the physical laws established within my physical realm of reality. There is nothing within my scope of observation, within my relativistic prison, that forbids the pos­sibility of my hypothetical piece of history from taking place. I therefore reasonably speculate that the universe contains, but is not limited to, my personal past event-horizon. And my intuition pushes me to suppose that my personal past event-horizon is but a minute aspect of the real universe. What I see, therefore, is a restricted view, which is distorted by the very fabric of which it is made. Suppose I am my grandson × great12 in the year 2333 AD. I am witnessing the Betelgeuse supernova. I know that Betelgeuse is 640 light-years distant. I therefore conclude that the event I am witnessing really took place 640 years ago. I mentally transport myself through time and space. I am in the vicinity of Betelgeuse 640 years ago. I see the mighty star explode. Question: is it, or is it not, scientifically meaningful for me to say "Right now on Earth the trials of the Salem Witches are taking place"? Both these events: the Betelgeuse supernova, and the trials of the Salem witches, occurred 640 years before the year 2333 AD on Earth. Intuitively, they must have done. The difference between these two events is that the Betelgeuse supernova (which, in 2333 AD I now see) occurred within my past event horizon, whereas the trials of the Salem Witches did not. I am witnessing the Betelgeuse supernova. But I cannot, by any means, observe directly the trials of the Salem Witches. Nonethe­less, that they really occurred 640 years ago, I have no doubt. My past event horizon is a domain of space that contains all points from which I can suffer effects transmitted to me through the medium of space at the speed of light. If the speed of light were infinite, this would include the whole universe and I would experience all of it as it is "now". But since the speed of light be finite, each point in the space of my past event horizon is tied to a specific time ago, depending on its distance from me. Events at two points in my past event-horizon that are equi­distant from me but in different directions occur at the same amount of time into my past. Suppose these two events occurred T years ago within my past event-horizon. Notice that I say my past event-horizon. I can visualize these two "simultaneous" events as taking place on a kind of geometrical "surface" within my past event-horizon. This surface contains all points in my past event-horizon that lie T years into my past. As an observer on Earth in the year 2333 AD, the Betelgeuse supernova lies at a point on the surface T=−640 years within my past event-horizon. 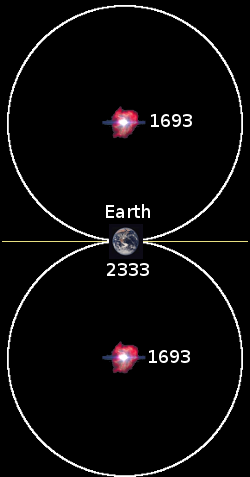 I suggest that the Earth in 1693 during the trial of the Salem Witches also lies on the surface T=−640 years. But it would seem that the part of the surface on which it lies is not within my past event-horizon. It would seem that the surface, T=−640 years, intersects my past event-horizon but extends beyond it into a realm that is, for me, fundamentally unobservable. Neither light, nor any other natural vehicle of information, can intimate to me anything about it. So how can I possibly know about the trials of the Salem Witches? It seems that information can somehow arrive at me (an observer) from outside my past event-horizon and without travelling through space at the speed of light. Information that arrives this way is, however, fundamentally different and is highly susceptible to many forms of distortion. It is what we call history. But the validity and reliability of history is a different topic. Suffice it to say that history is sufficiently reliable to verify, with utmost certainty, that a realm outside of one's past event-horizon does really exist. It seems, therefore, that my Einsteinian event-horizon encloses but a small sector of what I shall term my personal time-horizon. This comprises a continuum of concen­tric spheres that include the sphere at which T=−640 years. Perhaps I could better name this particular sphere "S = now − 640 years", in which "now" is the point in time at which my conscious awareness is currently located. From my point of view as an observer on Earth in 2333 AD, the Betelgeuse super­nova and the trials of the Salem Witches were not simultaneous events. They both took place in 1693. The trials of the Salem Witches, however, took place outside my Einsteinian event-horizon. So to me, as a relativistic observer, they never existed. Notwithstanding, both events are on the same (S = now − 640) sphere within my time-horizon. So I can safely assert that, relative to me, they were simultaneous, even though the universe itself can never directly convey to me any view of the trials of the Salem Witches. I shall now take philosopher's licence to speculate that the sphere S = now − 640 in my past event-horizon contains nobody's "now". Nothing that I see there exists in its present state at the point in time at which my conscious awareness is currently located. It can only have been somebody's "now" in my past. The notion of "now", however, is problematic. It is an artificial concept that may not really exist. It can only be thought of as a vanishingly small extent of time δt. But it is strictly only an instant, which is not an extent of time at all. Despite its infinitely small extent, "now" is what accommodates in full each observer's conscious aware­ness of the universe and all that is and happens therein. I am sitting at my computer typing these words. My friend is sitting at her comput­er typing an email. Our heads are about one metre apart. As I look over to see what she is doing, I become aware that what I see is not happening now. It happ­ened about 3 nanoseconds ago. Within my event-horizon, her "now" (as I see it) is 3 nanoseconds behind (i.e. later than) mine. Reciprocally, my "now", as seen by her, is 3 nanoseconds behind hers. Thus, within each of our respective personal event-horizons, our two personal "nows" are not simultaneous. However, this symmetrical reciprocity suggests to me that our two "nows" must be synchronized within some kind of enigmatic framework that transcends both our personal event-horizons. This leads me to speculate further that the point S = now, at which my conscious awareness resides, is but one point on a mathematical now-surface, which contains all the points at which individual conscious awarenesses do or can reside. As an aid to conception, let this surface be spherical. The S = now surface thus becomes the universal sphere of conscious simultaneity. Its radial dimension is time. The sphere's two-dimensional surface area conceptually represents real 3-dimensional space. The radius of the sphere is continually increasing with the passage of time. Its sur­face (real 3-dimensional space) must therefore also be expanding with the passage of time. In this conceptual framework, the point at the centre of this sphere represents the beginning of time. Remember, however, that this sphere is conceptual, its 2-dimen­sional surface representing our 3-dimensional space. This makes the centre of the sphere a conceptual vanishing point in the same way that the extended edges of a cube meet at two vanishing points when drawn on a 2-dimensional sheet of paper. The structure of the framework does not dictate that time should, or that it should not, have a beginning. 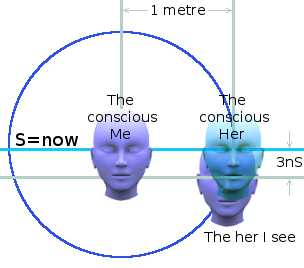 A consequence of this conceptual framework is that the personal event-horizon, of each sentient observer in the universe, must necessarily be represented by a small bounded volume that lies within this sphere. 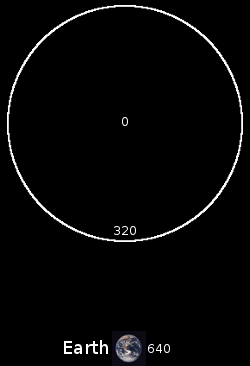 Earlier positions of the surface of the "now"-sphere will thus slice through each observer's personal event-horizon. Hence, as I look out into my personal event-horizon, I see earlier and earlier states of the real universe. This is explained more fully in my personal view of the universe. 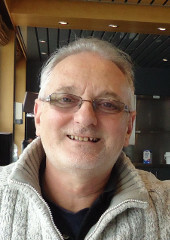 My thinking here has led me to favour the idea that, although there may be no uni­versal simultaneity between events that occur within the overlapping event-horizons of different relativistic observers, there may be a domain of universal simultaneity in which all their agencies of conscious awareness reside. And this domain is that which I have attempted herein to represent conceptually as the "now"-sphere.